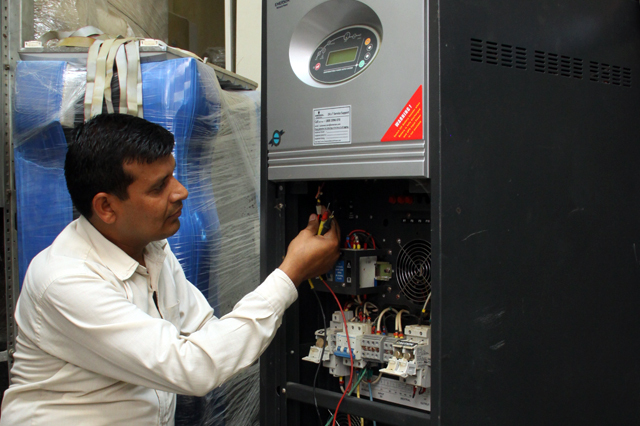 “Power Solution Services” founded by Mr. Sanjeev Kumar Garg in 2001 at Vadodra (Gujarat), then did set up in Noida in 2004, is one of the Top AMC service provider for online UPS of Emerson/TATA Liebert & other branded make UPS Systems. Apart from this we also provide UPS & Battery on rent basis and sale and Purchase. We have a presence of more than 15 years in the market. We are providing services on PAN India basis through our branch offices at Mumbai, Bangalore, Hyderabad, Chennai, Jaipur, Chandigarh, Calcutta & other major metro cities. Power Solution Services is a recognized organization having its own signature in the UPS market. We have highly qualified team of engineers having specialization in UPS field making our clients extremely pleased with our services. We are offering UPS on lease to all major IT organizations & process industries. The clientele list of Power Solution Services constitutes of a widespread number of prominent clients. Services are provided by us to the satisfaction of more than 100 nos. of our existing clients. Annual Maintenance Contract Services (AMC) of UPS systems with Total Peace of Mind and Equipment Care Plan. UPS Rent service for online UPS capacity from 1kva to 500KVA and SMF battery bank for UPS. Spot Services for Online UPS system. Selling reconditioned branded ONLINE UPS system with warranty/Guarantee support. Provide branded NEW ONLINE UPS system with branded battery. Transient Voltage Surge Arrestor and Chemical Earth solution for sensitive equipment. Servicing of other company make UPS systems, DC power supplies and other electronic equipment’s. Repairing job of UPS/Electronics equipment Cards. Selling Power Devices like IGBT/Fuses DC/AC Capacitors etc. Battery Maintenance for all type of batteries. Supplying of Sealed Maintenance Free (SMF) Batteries for UPS systems and other applications. Consultancy for UPS and power electronic equipment’s. Installation and commissioning jobs etc. of Power electronic equipment. We have very strong networking to provide the Single Point Solution with best services at very much Economical price. The engineers appointed at the company are exceedingly qualified on the technical front with expertise in AMC maintenance of products like Emerson/TATA Liebert UPS System from 1KVA to 800KVA on PAN (Presence across Nation) India basis. The engineer’s assigned jobs at this organization are having at least 10 years of experience in the field of UPS and Batteries maintenance. The branch offices of our company are located in Noida as well as we have resident engineers provisioned at Mumbai, Ahmadabad, Bangalore, Hyderabad, Chennai, Jaipur, Chandigarh, Calcutta & other major metro cities. We are the leading service provider for AMC & Renting for Emerson/Tata Liebert, PCI, APC, Hirel, Powerware & other branded UPS systems. We are also maintaining throughout DMRC across the whole Delhi NCR & Jaipur Metro for Emerson UPS System of 10KVA to 120KVA. Expert level of maintenance of UPS is served with accurate preventive measures. Reasonably priced maintenance along with guarantee of quality is furnished.